Does this look like a bunch of food for you? If you answered ‘yes,’ then you might want to read on. Image via UCS. If you’re like most people in the world, reducing beef and pork consumption is the single most environmentally friendly decision you can make. 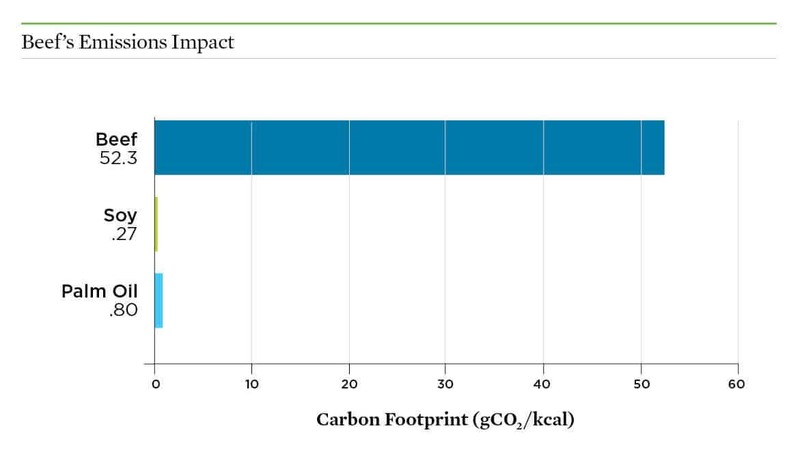 Few other commodities (let alone foods) come with such a strong environmental footprint, in terms of greenhouse gas emissions, water consumption, and terrain usage. Oh, meat companies — especially the big guns — will tell you otherwise. They’ll tell you what a big effort they’re doing, and how sustainable and green their products are. Take Burger King for instance. They pledged to completely stop deforestation by 2030, but recent reports show that their deforestation is in no way slowing down. Greenwashing is a term we’d best familiarize ourselves with as soon as possible because it’s incredibly prevalent in today’s world. Greenwashing is when a company uses deceiving PR and advertising to boast about how environmentally-friendly it is, but in reality, it’s really not. Take Exxon Mobil, the world’s largest oil company, who talks a lot about adapting to climate change, but spends millions and millions funding climate change deniers, and carries on with its usual operations. Burger King pledged to greatly reduce its deforestation practices, to a great extent due to “peer pressure” — McDonald’s had already done it, as did Walmart. Not wanting to be left behind, Walmart also promised to reduce deforestation. Promises are free, right? “The pledge from Burger King to stop deforestation by 2030 is simply absurd and not acceptable,” Lars Lovold, director of Rainforest Foundation Norway, told DW. But from the get-go, things weren’t looking good. A 2016 UCS study gave Burger King’s efforts a 0 out of 100. None of the analyzed companies got a good or better rating, though McDonald’s scored 48, and Mars Inc scored 37. Aside from Burger King, Pizza Hut also got a 0. Rainforest Rescue campaigner Mathias Rittgerott also bashed Burger King’s initiatives as mere baseless PR. 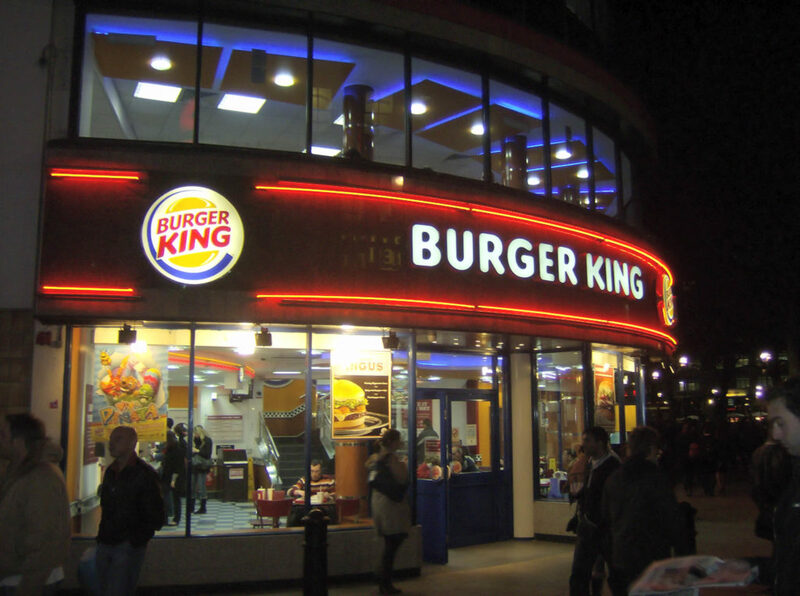 “Burger King has felt the pressure from other companies and wants to get out of the black list,” Rittgerott told DW. In March, data gathered from satellites and drones as well as field research showed that around 700,000 hectares (1,729,738 acres) of forest were wiped out between 2011 and 2015, affecting jaguars, giant anteaters, and sloths, among many other creatures. Local indigenous populations also suffered and in some cases were forced to completely relocate. 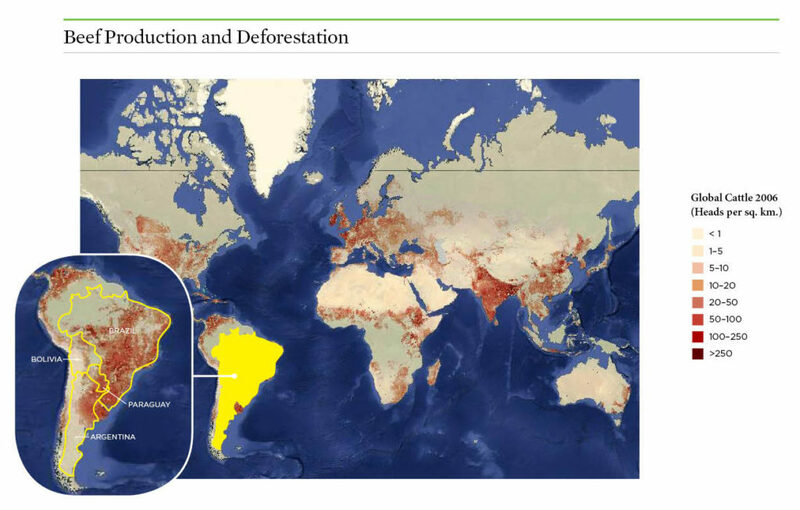 Though cattle production is distributed widely around the globe, its deforestation impact has been particularly high in South America, with Brazil, Paraguay, Argentina and Bolivia all experiencing high levels of cattle-driven deforestation. Source: Map made with the Livestock Geo-Wiki, using data from Robinson et al. 2014. Credits: UCS. Soybean is one of the main causes of deforestation, globally. Soy is mostly used to feed livestock, with only 6% of soybeans grown worldwide ending up as human food, and 70-75% of it ending up as livestock. The rest is mostly used for biofuels. Already, more than half of the Brazilian savannah — the Cerrado — has been deforested, most of it to support livestock agriculture. Beef production is by far the leading cause of tropical deforestation, and it’s not like you can just eat European cows and think you’ve helped fight deforestation — those cows have likely been fed with soy from deforested tropical areas. The outsized deforestation impact of beef produced in the tropics looks even bigger on a per-calorie basis. Source: Persson et al. 2014, Figure 3a. Just look at Buge and Cargill, two of the world’s largest soy producers. Together, they were responsible for the loss of the 700,000 hectares referenced above and they’re also not living up to their commitments. All this inefficiency in beef production is evident in its price. Pound per pound, beef is, on average, 4 times more expensive than poultry and 17 times more expensive than wheat. In terms of environmental damage, the impact of beef ranges from 6 to 34 times that of pork, poultry, dairy, and plant-based foods. It also requires more land than all these foods. This is why beef is an extremely serious environmental problem, but also an opportunity because reducing beef consumption can make such a big difference. The companies here have little direct incentive to change their practices. What does Burger King care about deforestation? Why should they care if animals and humans suffer, why should they give a damn about greenhouse gas emissions? Unfortunately, without strict policies (which is highly unlikely at this point), they just don’t. So it’s up to us, the consumers, to start making a difference. As consumers, we have a lot of power to persuade companies to become more moral. We should exercise it. Image via Wikipedia. We have the most power to force action, by hitting companies where it hurts the most: in their pockets. The decision to not buy from immoral companies is one that we can all make, and it can go a very long way. Thankfully, we have access to unprecedented product variation. Just go to any supermarket or any mall, you’ll find dozens if not hundreds of similar products. Stay informed, look deeper than the press statements, and understand what companies are actually trying to reduce their negative impact, and what companies are just greenwashing. It’s a great power that we, the consumers have, and it’s one that we don’t exercise as often as we should. As they say, with great power comes great responsibility — so when you’re buying beef or a burger, just spend a moment and consider what you’re actually supporting. You might end up making a better choice.